The Holocene epoch is the geological period extending from the present day back to about 10,000 radiocarbon years, approximately 11,430 ± 130 calendar years before present (BP) (between 9560 and 9300 B.C.E.). The Holocene is the fourth and last epoch of the Neogene period (or second epoch of the Quaternary sub-era) of the Cenozoic era. The Holocene was preceded by the Pleistocene epoch, which began about 1.8 million years ago (mya) and ended at a time corresponding with the end of the Paleolithic age used in archeology. The Holocene epoch is the culmination of billions of years of a step-by-step process of development, with life beginning in the Precambrian and unfolding through various eras, periods, and epochs. Each stage built on the foundation of the previous stage and laid the foundation for the next stage. During the billions of years of life, there have been many mass extinctions. Many believe that the earth is presently undergoing another mass extinction event, the "Holocene extinction event," and consider the arrival of human beings, and their dispersal over the globe, as linked to this current event. What is apparent is that, unlike prior mass extinctions, current extinctions are not due solely to the forces of nature. People have the capacity to choose how they will impact the future of the other species on the planet and can choose to decrease species diversity or conserve biodiversity. The name Holocene comes from the Greek words ὄλος (holos), which means "whole" or "entire," and καινή (kai-ne), which means "new" or "recent." It has also been called the "Alluvium Epoch." It has been assigned to Marine isotopic stage 1 (MIS 1), which is an interglacial. The next glacial is yet to occur. The Holocene starts late in the retreat of the Pleistocene glaciers. Human civilization dates entirely to the Holocene. The Holocene was preceded by the Younger Dryas cold period, the final part of the Pleistocene epoch. The Younger Dryas stadial, named after the alpine/tundra wildflower Dryas octopetala, and also referred to as the Big Freeze (Berger 1990), was a brief (approximately 1300 ± 70 years) cold climate period following the Bölling/Allerød warming at the end of the Pleistocene and preceding the Preboreal of the early Holocene. The end of the Younger Dryas has been dated to about 11,500 calendar years BP (9500 B.C.E.). However, evidence for the Younger Dryas is not clear cut anywhere other than in the Northern Hemisphere. The Blytt-Sernander classification of climatic periods defined, initially, by plant remains in peat mosses, is now of purely historical interest. The scheme was defined for north Europe, but the climate changes have been claimed to occur more widely. The periods of the scheme include a few of the final, pre-Holocene, oscillations of the last glacial period and then classify climates of more recent prehistory. Paleontologists have defined no faunal stages (divisions based on fossils) for the Holocene. If subdivision is necessary, periods of human technological development, such as Paleolithic, Mesolithic, and Neolithic, are usually used. Continental motions are negligible over a span of only 10,000 years—less than a kilometer. However, ice melt caused world sea levels to rise about 35 meters (110 ft) in the early part of the Holocene. In addition, many areas above roughly 40 degrees north latitude had been depressed by the weight of the Pleistocene glaciers and rose as much as 180 meters over the late Pleistocene and Holocene. The sea level rise and temporary land depression allowed temporary marine incursions into areas that are now far inland. Holocene marine fossils are known from Vermont and Michigan in the United States, and Quebec and Ontario in Canada. Other than higher-latitude temporary marine incursions associated with glacial depression, Holocene marine fossils are found primarily in lakebed, floodplain, and cave deposits. Holocene marine deposits along low-latitude coastlines are rare because the rise in sea levels during the period exceeds any likely upthrusting of non-glacial origin. Although geographic shifts in the Holocene were minor, climatic shifts were quite grand. Ice core records show that before the Holocene, there were global warming and cooling periods, but climate changes became more regional at the start of the Younger Dryas. The Younger Dryas saw a rapid return to glacial conditions in the higher latitudes of the Northern Hemisphere between roughly 12,900–11,500 years before present (BP) (10,900 B.C.E. to 9,500 B.C.E. ), in sharp contrast to the warming of the preceding interstadial deglaciation. However, the Huelmo/Mascardi Cold Reversal in the Southern Hemisphere began before the Younger Dryas, and the maximum warmth flowed south to north from 11,000 to 7,000 years ago. There appears to be a south to north pattern, with southern latitudes displaying maximum warming a few millennia before the Northern Hemisphere regions. The Holocene climatic optimum was a period of warming in which the global climate became 0.5-2°C warmer than today. It began roughly 9,000 years ago and ended about 5,000 years ago, when the earliest human civilizations in Asia and Africa were flourishing. However, the warming was probably not uniform across the world. This period of warmth ended with a cooler period with minor glaciation, which continued until about 2,000 years ago. At that time, the climate was not unlike today's, but there was a slightly warmer period from the tenth to fourteenth centuries, known as the Medieval Warm Period. This was followed by the Little Ice Age, from the thirteenth or fourteenth century to the mid nineteenth century, which was a period of significant cooling, though not as severe as previous periods during the Holocene. The Holocene warming is an interglacial period and there is no reason to believe that it represents a permanent end to the Pleistocene glaciation. It is thought that the planet could return to a new period of glaciation in as little as 3,000 years, although 19,000 years has also been posited. However, if the current global warming continues, a super-interglacial might occur, and become warmer and possibly longer than any past interglacial periods in the Pleistocene. A super-interglacial could become warmer than the Eemian Interglacial, which peaked at roughly 125,000 years ago and was warmer than the Holocene. During the Holocene, habitable zones expanded northwards. Large mid-latitude area such as the Southwestern United States, which were previously productive, became deserts. The epoch started with large lakes in many areas of the world that are now quite arid. The "8.2ka event" is a climatic event thought to be the most prominent climatic event occurring in the early Holocene epoch. It was an abrupt cold period that occurred from about 8400 to 8000 years ago (Barber et al. 1999). Animal and plant life have not changed much during the relatively short Holocene, but there have been major shifts in the distributions of plants and animals. A number of large animals including mammoths and mastodons, saber-toothed cats like Smilodon and Homotherium, and giant sloths disappeared in the late Pleistocene and early Holocene—especially in North America, where animals that survived elsewhere (including horses and camels) became extinct. The Holocene extinction event is a name customarily given to the widespread, ongoing extinction of species during the modern Holocene epoch. 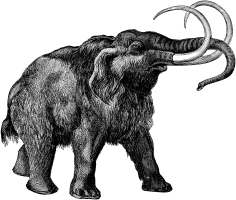 The genera vary from mammoths to dodos, to species in the rainforest dying every year. Because some believe the rate of this extinction event is comparable to the "Big Five" mass extinctions, it is also known as the Sixth Extinction, although the actual numbers of extinct species are not yet similar to the major mass extinctions of the geologic past. In broad usage, the Holocene extinction event includes the remarkable disappearance of large mammals, known as megafauna, by the end of the last ice age 9,000 to 13,000 years ago. Such disappearances have been considered as either a response to climate change, a result of the proliferation of modern humans, or both. Also, some scientists have considered the possibility of new diseases and super-viruses. These extinctions, occurring near the Pleistocene/Holocene boundary, are sometimes referred to as the Pleistocene extinction event, or Ice Age extinction event. The Ice Age extinction event is characterized by the extinction of many large mammals weighing more than 40 kg. Among the major megafauna exterminated about 9,000 to 15,000 years ago were the woolly mammoth, the woolly rhinoceros, the Irish elk, the cave lion, the cave bear, and saber-toothed cats. Within the past 2,000 years, a large number of species have become extinct in ways more clearly linked to human dispersal or activity, such as species of Moa (giant flightless birds) in New Zealand, around 1500 B.C.E., after Polynesian settlers arrived, and 17 species of lemur in Madagascar after arrival of humans 2,000 years ago. Notable examples of modern extinctions of mammal fauna include the Thylacine or Tasmanian tiger (Thylacinus cynocephalus); the Quagga (a zebra relative); the Dodo, the giant flightless pigeon of Mauritius; the Great Auk of islands in the north Atlantic; and the Passenger Pigeon of North America, which became extinct in 1914. The beginning of the Holocene corresponds with the beginning of the Mesolithic age in most of Europe. However, in regions such as the Middle East and Anatolia (Asia Minor), with a very early neolithization, the designation Epipaleolithic is preferred in place of Mesolithic. Cultures in this period include: Hamburgian, Federmesser, and the Natufian culture. Both are followed by the aceramic Neolithic (Pre-Pottery Neolithic A and Pre-Pottery Neolithic B) and the pottery Neolithic. Barber, D. C., A. S. Dyke, C. Hillaire-Marcel, A. E. Jennings, J. T. Andrews, M. W. Kerwin, G. Bilodeau, R. McNeely, J. Southon, M. D. Morehead, and J-M. Gagnon. 1999. Radiocarbon dating: Forcing of the cold event 8200 years ago by catastrophic drainage of Laurentide lakes. Nature 400(22):344-348. Berger, W. H. 1990. The Younger Dryas cold spell—a quest for causes. Palaeogeography, Palaeoclimatology, Palaeoecology (Global and Planetary Change Section) 89:219-237. Mackay, A. W., R. W. Battarbee, H. J. B. Birks, and F. Oldfield. (Eds.) 2003. Global change in the Holocene. London: Arnold. Ogg, J. 2004. Overview of Global Boundary Stratotype Sections and Points (GSSP's). Retrieved April 30, 2006. Roberts, N. 1998. The Holocene: An Environmental History, 2nd edition. Blackwell Publishing.